Quirky Ricochet now Willow was adopted by Heather and Switzi in Mt. Adams, and her two cats (Myszka & Sigfried), who were not available for the family photo. 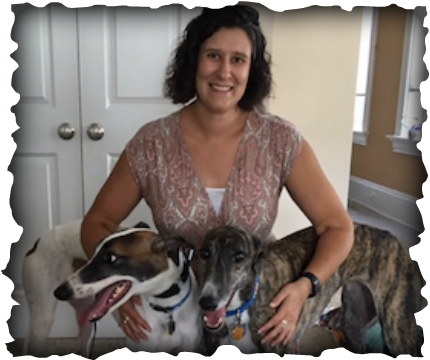 Heather adopted Switzi at our GAGC Picnic in May and fell in love with the breed. Well Switzi was starting to have potty accidents while Heather was at work. Heather knew she was lonely and decided she needed a GH friend. They met Willow and fell in love. These girls are greyt together and became FAST FRIENDS! I'm sure we'll see them at the GAGC Fall Fun Day in September!